​Your donations/purchases are tax deductible. Goodie Bones Are a Great Way to Support Us and Spoil Your Pet! We love our pets as we love our children. As a 501(c)(3) Non Profit Charitable organization, our mission is to save shelter pets from the cold harsh reality of euthanasia and neglect. Every cent of your donation for a bag of Goodie Bones goes directly to the rescue and aides in providing medical care and rehabilitation for the pets who have lost their way or have been abandoned. I wouldn't feed my fur babies anything but the best, and you can be sure these are the best! We make them for our dogs and our friends dogs and now we're making them for you! They are Absolutely healthy, (We munch on em too!). Our Goodie Bones are All Natural, Organic, Vegan dog treats made with Peanut butter, Coconut, Banana, Applesauce, Oats and Baking Powder. They are 3 inches long and 1 inch thick and are soft for all size dogs with or without teeth. You get 12 fresh, handmade, bone shaped treats of chewy goodness in every bag. If you're going to spend $10 on dog treats, wouldn't you rather they improve your pups health/skin/coat, naturally? We know we would! ​To get your Goodie Bones send your donation of $10 through our PayPal account and in the comments box put your phone number and address so we can contact you in 3 days to deliver your bags of Goodie Bones. That's right your Goodie Bones will be ready in 3 days. If you want to pick them up yourself, send us your order through our contact page and we will deliver your order COD in three days. What could be an easier way to get some great healthy treats for your dog(s) delivered right to your door. 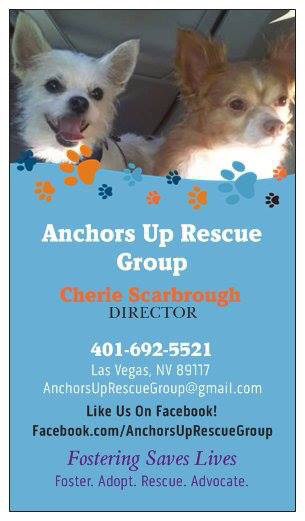 Thank you from all of us at Anchors Up Rescue.